John Barrett (Service No. 2897) was born in Mount Kembla on the 29th of April 1895 to John and Kathleen Barrett. At the time of his enlistment he was a 20 year and listed his occupation as fruiterer, and he noted that he had served in the Cadets. 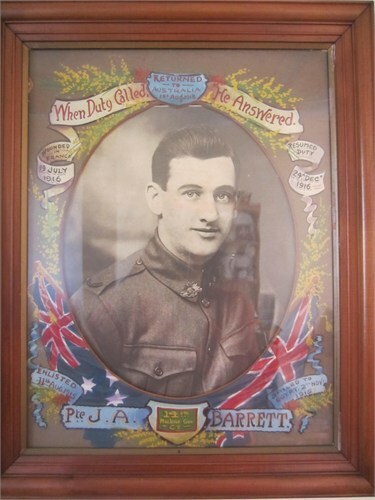 Private Barrett embarked on the HMAT A14 Euripides with the 6th Reinforcements 17th Battalion on the 2 of November 1915. In France he transferred to the 5th Machine Gun Battalion and saw service on the Western front. In July 1916 he was admitted to hospital having been wounded in action. He had received a gun shot wound in the arm. John returned to Australia on the 7 June1918. In the same year he received a grant of two hundred and fifty pounds and opened a fruit and confectionary business in Cessnock. In 1920 he married Mary Middlemas and they raised their family there. He died in Cessnock on Armistice Day, 1945. John Aubrey Barrett was my grandfather, my mother Betty Irene Barrett, being his daughter. I have his death certificate, along with many other items, the death certificate stating that he actually died at his/their place if residence at the time, being 1 Ellis Road, Waratah, NSW, not in Cessnock. John Aubrey Barrett was my great grandfather, my grandfather John William Barrett (Jack) was his son. Thought I'd look up some information on my great grandfather and found this page. Great to find all his info.